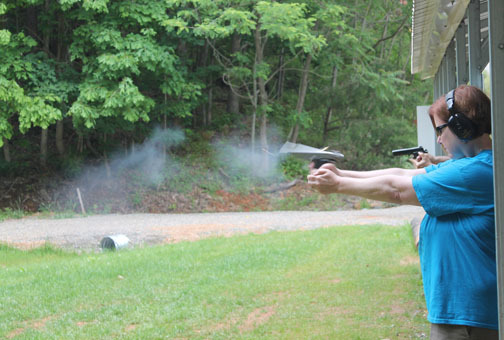 Women have multiple challenges carrying a firearm. Many of those challenges are due to the curves and shorter waists of the female body. Adding to the problem is finding holsters that can be worn comfortably, discreetly and safely while allowing for effective access to the firearm should the need arise. Most holsters are designed by men for a man's body and typical male clothing styles. For larger, full-figured women the challenges are even greater. A large bust makes reaching for the firearm difficult and sometimes impossible, if crossing the body is necessary. A fuller middle also interferes with reach and accessibility. Clothing styles and options that accommodate concealed carry are limited, which only adds to the problems and frustrations. For some women, the combination of these challenges makes typical methods of concealed carry so uncomfortable and frustrating that they give up trying. Each woman naturally will have her own set of challenges because every woman's body is unique. But the issues faced by larger women are significant and the topic is often neglected. Here, I will attempt to break down the problems as shared by hundreds of women who frequent The Well Armed Woman site, as well as advice and ideas they shared that work for them. Again - there is no single solution to the various problems larger women have, but I hope to offer two things: one - the sense that, as a larger women, you are not alone and that many women share your frustrations; and two - that through the sharing of all of these women, perhaps there is a suggestion or two that you will find helpful to carry your firearm safely and comfortably. All women need to push through and overcome their particular obstacles because if your gun is not on or with you - it can't protect you. Buxom women shared a few key issues pertaining to full-sized busts. The primary issue is reach. They simply can't get around their breasts to get to their gun, whether in a shoulder, cross-body, an on- or in-the-waistband holster, or even a bra holster. One might assume that a bra holster would work well, given that large breasts create sufficient "hiding space" for a gun, but a majority of larger women responded that bra holsters don't work for them, explaining that the gun "gets lost" and is extremely hard to draw. Sweat under the breasts was another key negative commonly shared. Being wide around the middle restricts the ability to reach the holstered firearm especially with bra holsters and on- or in-the-waistband holsters (whether appendix or cross body). The need to wear looser stretch pants with elastic waistbands also limits the possible options for on- or in-the-waistband holsters as they need the support of either a sturdy, wide belt or a substantial and tight waistband. Having a large middle also makes it tough to access an ankle holster. Another common frustration of larger women is that the grip of the gun digs into them in most on-the-waist forms of carry. Most women are more short waisted than men. This makes drawing from an on-the-hip holster difficult as there is not enough room to fully clear the firearm without running a fist into the underarm or breast. And the more of you there is in that shorter distance, the tougher this becomes. The distance is simply not sufficient for an effective draw. Most on-the-hip holsters ride too high which only makes things worse. When you factor in elastic or weak waistbands and it becomes almost impossible. So, what can you do to make concealed carry more comfortable and effective for you? This depends on your climate, and any one of the above issues or a combination of them. But there are a couple of common areas of agreement among the women we polled. The majority found the belly band to be a very good option. Lying against the skin, it can be rotated to any position around the middle. Belly bands can also be worn high or low on the middle, so the user can find the location most comfortable for her and which provides the easiest access to her gun. Unfortunately, a common complaint was that in warmer weather, belly bands can be hot to wear. An alternative suggested by very large chested women was using an inside-the-waistband holster like "The Betty", but clipping it to the top of the bra near the arm pit. So the gun lies on top corner of the breast, not under it. A simple reach through the collar of the shirt allows for easy access. Carrying the firearm on the waist with a loose fitting cover shirt or in the pants, off the back of the hip, more toward the small of the back was another successful position for many of the larger chested, wider middle women. The middle and the bust do not come into play which allows for smoother access. Whenever holstering on the back, however, a woman must be hyper alert to her surroundings as she may be more vulnerable to another person gaining access to it from behind. The Remora or a similar rubberized pocket holster, which will stick firmly to clothing without the need of a clip was another popular option for in-the-waistband carry. Many women reported to me that because of the non-slip qualities of the rubber - you can place the firearm in any location and it stays put, making it ideal for stretch waistbands. Another suggested option is a magnetic outside-the-waistband holster, which instead of a metal clip, uses a very strong magnet that locks shut over the waistband. No belt is required, the strength of the magnet providing the necessary support. Also available are paddle holsters which slide down the inside of the pants, acting as a brace to keep the holster in place when no belt is available. For larger women who happen to be long waisted, a very positive solution is to wear low rise pants. The lowered waistband will increase the distance between the grip of the gun and the armpit. Adjusting the location to just off the hip (front or back) and adjusting the cant to a steeper angle for easier access is also effective. For women whose middles were "in the middle", the most successful reported option was in-the-waistband, appendix-style carry. Because the firearm is carried in the fleshy front (in front of the hip bone) this was found to be a very comfortable carry position, providing good access to the waist area. The ankle holster was suggested by many women who deal with large bust and shorter waist issues, but this option is reported as ineffective for women who are larger in the middle as noted earlier. The last and most reluctantly suggested option for most of these women is carrying in a concealed carry purse or fanny pack. Carrying in an external bag takes an extra dose of awareness and responsibility, but for many women it can be the difference between carrying and not carrying. When this is your only option, the firearm must be in a sleeve or pocket holster with the trigger fully covered and the firearm in a separate compartment within the bag. There are just too many items in the purse that can get in the trigger guard and contribute to an accidental discharge. The bag must be on you and with you at all times. Having the firearm in a separate compartment also makes access easier and faster. No fumbling around - you know right where it is. Practice is essential when wearing any new holster or when changing the position of one you already use. The utmost care must be taken to make sure you are not "covering" yourself at any time during holstering and un-holstering. Practice with your UNLOADED gun (checking 3 times) to get comfortable and effective with the new holster and location. Our ability to carry a concealed firearm is a powerful equalizer for women when assaulted. For many large women, running away or running for cover may not be a realistic option. 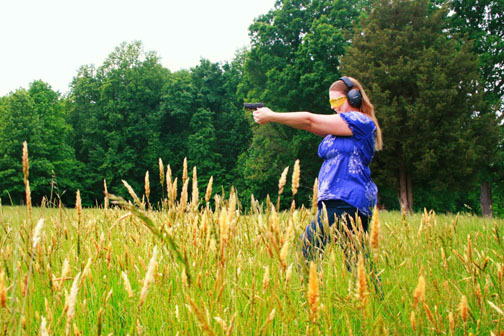 She must be able to access her gun quickly, safely and with the skill necessary to defend herself. That requires at least three things: The gun must be with her, it must be holstered in a manner and location that SHE can manage and she must be well-trained and prepared to draw and use it effectively. A sincere thanks to all the women who bravely shared their stories, challenges and photos with The Well Armed Woman. Hearing about your struggles and sharing what works for you will no doubt help others.